Only a few days till December and I’m getting ready for a busy period of performing magic and meeting lots of awesome people!! In fact, last Saturday I performed at my first Christmas party at The Hilton Hotel at Edinburgh Airport. For any magician, Christmas is often the busiest time of the year and I am no exception. 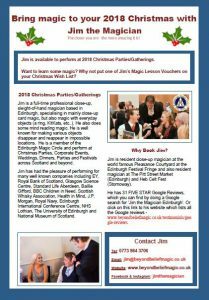 But I still have a few days/nights available in December (and January), so if you are wanting to bring some magic to your Christmas party or gathering, please do get in touch (jim@beyondbeliefmagic.co.uk) (0773 984 3706) or use my Contact Form. 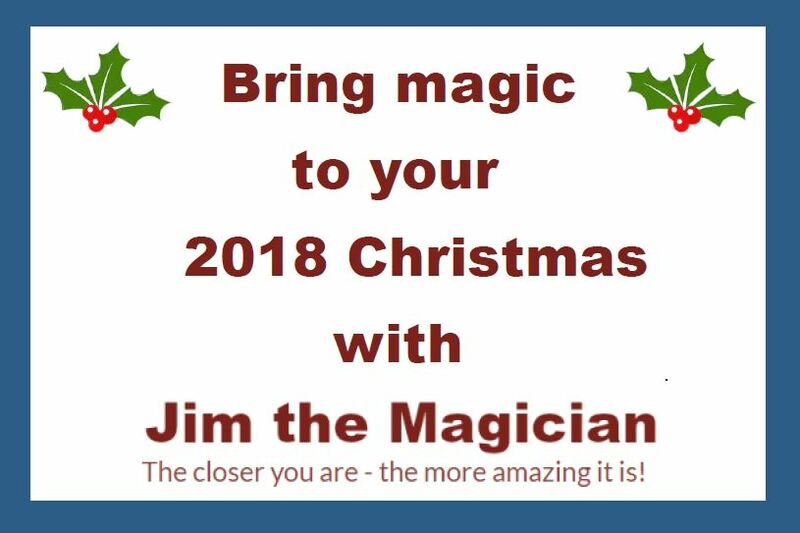 If you are struggling on deciding what to buy for one of your loved ones for Christmas, why not get them a magic lesson, I teach card magic at beginners and intermediate level. With a background in training and education, everyone seems to love my teaching. I can provide one-to-one lessons or group classes. 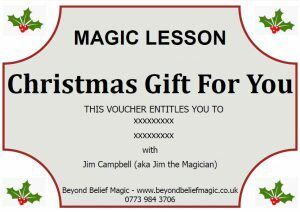 So get in contact for one of my Magic Lesson Vouchers or add it to your own Christmas Wish List? On Saturday, not only did I perform at my first Christmas Party, but also my first children’s party, a 10 Year old Birthday Party. Her father had seen my magic a few months ago at a corporate event and afterwards had told his children about my magic and they were keen to have me perform at the birthday party. I learnt some new magic with sweets and although a little nervous, it was really enjoyed by everyone, children and adults included (!!). At the end I asked the children for a bit of feedback, saying this was my first (full) children’s magic show and they all said they thought the sweet magic was the best!! Thanks Steve Rowe for that. So if you love my magic, why not book me for a Children’s Magic Party, ages 10 years and upwards. Looking forward to seeing some of you at parties in December.